ALEX Salmond last night ­defended the SNP’s decision to vote on English policy at ­Wesminster when he received an honorary degree from Glasgow University. The former first minister said: “There is a debate in this election campaign about the legitimacy of a large contingent of SNP MPs voting for what they believe in in the Westminster Parliament. 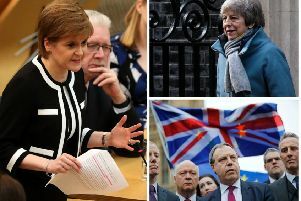 “This disquiet now includes the reincarnation of former prime minister, John Major, the man who, let us remember, rather carelessly mislaid every single Tory seat in Scotland. His position is fundamentally undemocratic. A key vote from the past tells us why he is wrong about the future. “In November 2004, the SNP had five MPs in the Westminster Parliament. Tony Blair had a ­majority of 160. “However, in proposing to ­introduce top-up fees for English students, he strained loyalty to the limit as he had specifically ruled it out in the 2001 manifesto. It was his ‘Nick Clegg moment’. “In any case, we took the decision to intervene in what seemed an English-only matter because we thought the policy could impact on the competitive position of Scottish universities.